We are happy to offer sports in two different athletic leagues to help foster student involvement and physical activity. 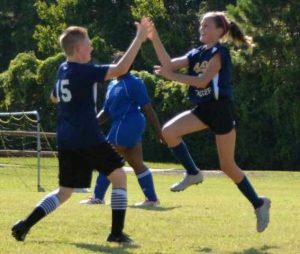 Grace’s involvement in the various sports opportunities is dependent on having a minimum number of students participate. Fall . Soccer Aug. – Oct.
Winter Flag Football Jan. – Mar. Spring Soccer Mar. – May Flag Football Mar. – Apr. Track and Field Feb. – Apr. If you have any questions regarding athletics, please contact the Athletic Director, Neal Mars at nmars@geds.net. Our mission is to foster competition in such a way as to glorify God while promoting good sportsmanship, respect for others, character development, and spiritual growth for all participants.